In 2008, a team of geo-radar specialists scanned the plateau and found that underneath, there appears to an underground labyrinth just like the one ancient writers described. As of yet, though, nobody has ever excavated it or stepped inside. Until somebody makes it into the labyrinth, we won’t know for sure whether we’ve really found Egypt’s greatest archaeological wonder. Herodotus wrote of the Labyrinth in the fifth century B.C. (History, 2.148-49): ‘It has twelve covered courts – six in a row facing north, six south – the gates of the one range exactly fronting the gates of the other. The walls are covered with carved figures, and each court is exquisitely built of white marble and surrounded by a colonnade’. For a long time, the true location of the Labyrinth remained unknown. 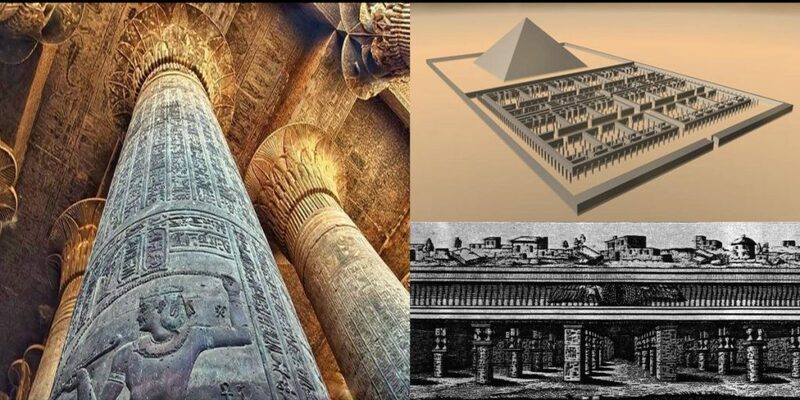 Since Herodotus visited the legendary labyrinth of Egypt 2500 years ago, the building disappeared in the mist of time. In 1888, Professor Flinders Petrie located the actual site of the Egyptian Labyrinth. Sufficient of the original foundations remained to enable the size and orientation of the building to be roughly determined. The Labyrinth was about 304 meters [997 feet] long and 244 meters [800 feet] wide. On other words, it was large enough to hold the great temples of Karnak and Luxor! When the Mataha Expedition scanned parts of the base area at Hawara in 2008 they found strong suggestion of complex chambers and walls several metres thick beneath the surface to considerable depth. 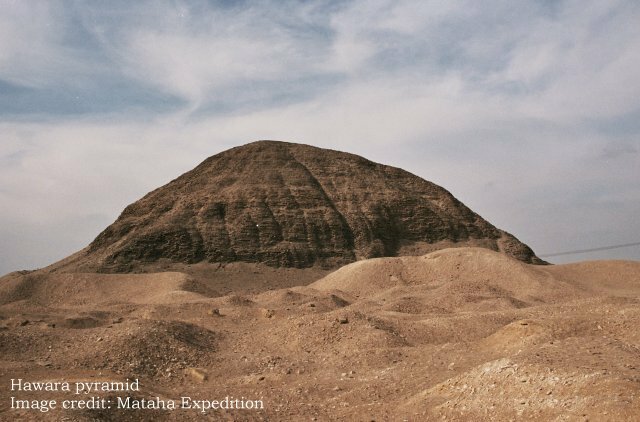 The findings of the research team confirmed that there were archeological features to the south of the Hawara pyramid of Amenemhat III. The scannings showed vertical walls of an average thickness of several meters, which were connected to form quite a number of closed rooms.